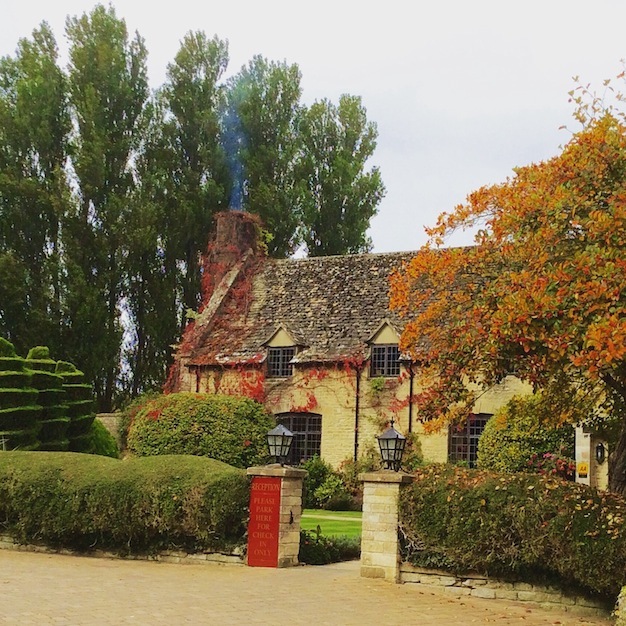 We enjoyed a cosy night away at The Old Swan & Minster Mill hotel in the Oxfordshire Cotswolds in the autumn. It’s in the quaint picture-book village of Minster Lovell, near Witney, and sits in 65 acres of gardens and woodland alongside the river Windrush. As the name suggests, this is a hotel of two halves. The Old Swan, a 600 year old village inn with creaking floors, wooden beams and narrow, winding staircases houses 15 bedrooms, some with four-poster beds. And on the other side of a small, shaded country road sits Minster Mill, home to 44 contemporary styled rooms, stretching backwards from an original working mill. historic rooms at the inn…. We stayed in the Mill – in a cosy double with whitewashed vaulted ceilings. Our boys set up camp in a slightly smaller twin next door (you can also book interconnecting rooms). There was a decanter of home-made sloe gin to welcome us and some lovely White Company toiletries to shower with before dinner. Food is served in the gorgeous Old Swan. With log fires and dim lighting it’s a special place to eat and the menu is top-notch modern bistro style. After a pre-dinner drink in the snug (where there are plenty of board games to play) we enjoyed a delicious meal including a chef’s special of 8-hour crispy pork belly with seasoned mash, red cabbage, carrot puree, buttered green beans and pork puffs. The boys enjoyed posh fish and chips – Oxford gold battered Brixham haddock with triple cooked chips, pea mash and tartare sauce and their dad opted for a Black Truffle & spearmint Oxfordshire lamb rump with fondant potato, autumn vegetables and red wine gravy. Next morning, after a hearty breakfast at the inn, we took a walk around the grounds. There’s plenty to see, including riverside walks, giant chess, a croquet lawn and tennis courts, plus chickens and the resident ducks Betty and Eddie to visit. It was also nice to see that the owners – the de Savary family – have invested in green renewable hydro-power energy. A contraption called an Archimedes Screw Turbine is powered by the river Windrush and provides electricity to the Minster Mill buildings. I was lucky enough to sample a gorgeous head, neck and shoulder massage at the hotel’s Windrush Spa whilst my other half took our sons on a bike ride courtesy of the hotel’s quintessentially English Pashley bikes. Then in the afternoon, following one of the hotel’s suggested walks, we explored Minster Lovell village, with its pretty-as-a-picture thatched cottages, on through the Windrush valley to the little village of Crawley and a stop off at The Lamb Inn before heading back and passing through the ruins of Minster Hall, a 15th century manor house on the river. The end to a lovely weekend.